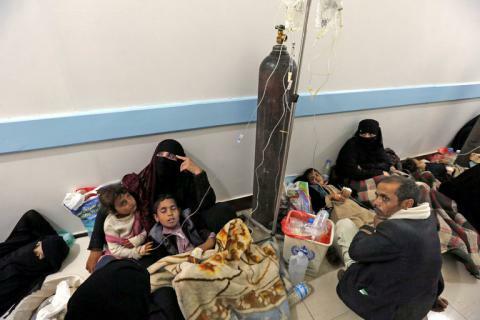 From April 27 until now, about 339,000 cases of cholera infection have been reported in Yemen. This is reported by the Emergency Response Coordination Centre (ERCC) in its daily reports. The Anadolu agency, referring to the World Health Organization, states that the number of victims of the cholera epidemic in Yemen reached 1,770 people. “Due to the ongoing armed conflict in Yemen, about three million people have become internally displaced persons and do not have access to drinking water and hygiene products,” the message says. “Since the outbreak of cholera, MSF has doubled the scale of its emergency response in Abs district, where teams have treated more than 12,200 patients with suspected cholera and acute watery diarrhoea. Fear of being caught up in the fighting has led many displaced people in Abs to set up informal settlements in remote locations with no public services. MSF is operating mobile clinics offering regular consultations, emergency treatment, antenatal care and mental healthcare to people living in these settlements, where sanitation is poor and water is scarce,” reports Medecins Sans Frontieres. “Unlike in other places, there are no big and structured camps for internally displaced people (IDPs) in Abs: they are generally living in informal settlements – sometimes close to villages/towns, sometimes detached. The usual pattern in the region is groups of households in rudimentary accommodations spread near main roads or deserted areas. Many people are willing to sacrifice their wellbeing and access to services, just to be the furthest possible from ground fighting and airstrikes,” the MSF writes.